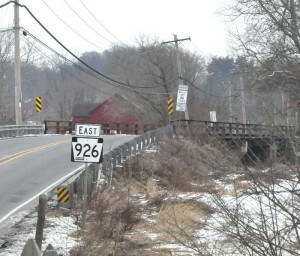 The aging Route 926 bridge over the Brandywine will have to survive at least one more winter, as PennDOT announced Friday that construction on its replacement will not start until March, 2016 at the earliest. For those of you dreading the start of construction of the Route 926 bridge replacement project, originally slated for August of this year, the Pennsylvania Department of Transportation (PennDOT) has good news for you: the project won’t start until March of 2016 at the earliest and will take less than a year — rather than the 18 months originally projected, the agency announced Friday. While that might be less than ideal news for some other local residents — many of whom have been pressing PennDOT for action on the rusting, decaying bridge over the Brandywine since at least 2000 — there are some confirmed details of the project now that had been in question previously. PennDOT confirmed that a traffic light will be installed at the intersection of Route 52 and Pocopson Road — expected to see a large traffic increase once the bridge closes — and that a full repave has been completed on the Lenape Bridge, which crosses the Brandywine just north of Route 926. As all preliminary engineering on the project is complete, the environmental clearance is expected to be granted in May, once the pending resolution of cultural and historic designations in the project area. Shortly after that, PennDOT will begin discussions with property owners on right of way issues and any potential acquisitions. A public meeting will be scheduled on the project in September, with a public presentation on the proposed detour route as well as any changes to the project plan. Once final engineering and design is complete this fall, the project is expected to go out to bid in November, with bids opened in December. Construction is slated to start in March, 2016 with a nine to ten month construction time line. If this schedule holds, the project’s completion would still be around the same time as the initial timeline — just with a much shorter build time. Still, the new proposed schedule represents a “best-case” scenario — and PennDOT officials warn that further delays could happen. The biggest potential for delay, they say, is possible disputes or litigation with local property owners of properties that must be acquired by the state to complete the project.